Severs | WILL I EVER DANCE AGAIN? Severs disease is an inflammatory problem found in the young dancer/athletes, and is related to periods of sudden growth. The problem is located at the back of the heel region. It has a similar mechanism to oschgood slatters disease found in the knee on the tibial tuberosity. 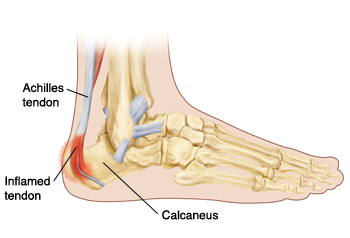 The foot is made up of many bones, the large heel bone being the calcaneum. It is around this bone that is effected by severs disease and often the site of pain. Attaching onto this bone are the muscles of the calf region. We contract these muscles in order to point the foot and bring us onto demi pointe and pointe. They are also used to propel us into the air on jumping and leaping. The calf region has many muscles. Some are very deep and move the toes, and help support the arch of the foot. These are called Flexor Hallicus Longus (FHL), Flexor Digitorum Longus (FDL) and Tibialis Posterior (TB) on the inside, and the Peroneals to the outside of the ankle and calf. 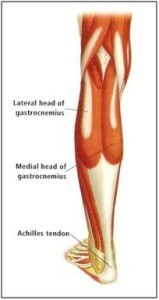 At the back of the calf is a muscle called gastrocnemius. This muscle has two bellies, and starts from the bottom of the thigh bone (femur), and forms a strong thick tendon, called the Achilles Tendon attaching onto the “heel” (calcaneum) bone of the foot. A second strong muscle sits below gastrocnemius, and it is called Soleus. This muscle arises from the back of the “shin” (tibia) and joins to gastrocnemius to also help form the Achilles tendon. When these muscles work together they point the foot, and also assist with take offs and landings in jumps. Pain to stretch and often sore when moving into plies. Diagnosis will be made by your physician or therapist following a series of questions, and hands-on assessment of the area. There is normally no need for x-ray. Treatment normally consists of exercise modification to become pain free. A heel raise may be useful in early stages. The condition will settle in time, normally over a 6-12 month period. It is important to keep the body conditioned if on a period of relative rest. Exercise that is pain free may be undertaken to maintain CV fitness such as swimming. Pilates matwork is also beneficial to maintain strength throughout the body. Although we cannot alter our growth patterns and rate we may be able to recognize if we are having a growth spurt and lessen the amount of activity that we undertake during this period. This will involve especially exercise that involves a lot of eccentric muscle work for example landing activities such as allegro.